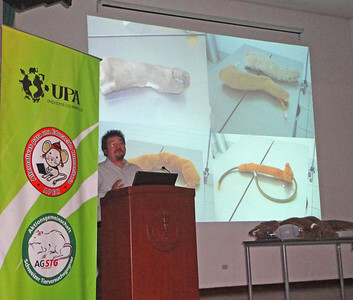 In August I was invited by Peruvian organisation UPA to deliver a lecture tour on humane teaching methods, animal experimentation, the animal welfare standards of veterinarians, and other animal protection topics. 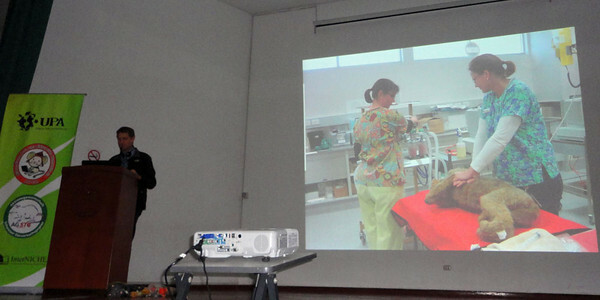 They worked me hard – I delivered 20 main presentations primarily at four conferences, participated in eight veterinary and medical school meetings with faculty members, four alternatives exhibitions, and five press conferences and media interviews. 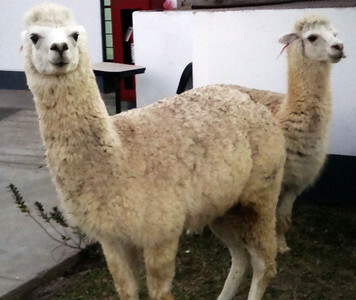 However, they also fed me well, and gave me a little time off to explore the Andes (see pics). Don't miss the published story of this adventure! 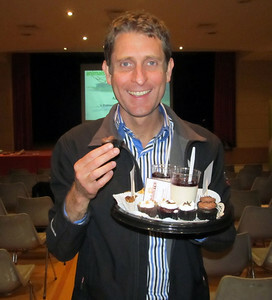 I'm grateful to Swiss organization AG STG for sponsoring the tour, and to InterNICHE for supplying the alternatives. 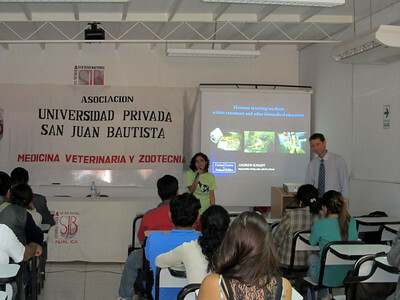 The second day after my 24 hour flights, they got me up at 4 AM for a four hour bus ride across the desert, to speak at the Universidad privada San Juan Bautista - a private university and veterinary school, in the town of Ica. We got back around midnight. However it went extremely well and it was amazing to see the arid deserts of coastal Peru. In the Australian desert there is usually some greenery, but these were like the surface of Mars, apparently devoid of all life. 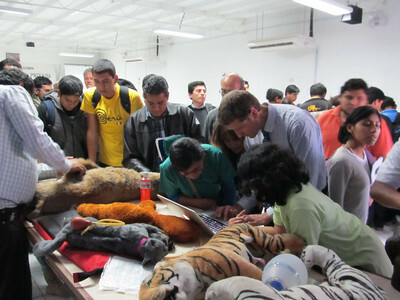 And the veterinary students were extremely interested in them. Here I'm demonstrating the 'Glass Horse' dissection simulation on my beloved Mac, ably assisted (as with my presentations) by my star translator Teresa. 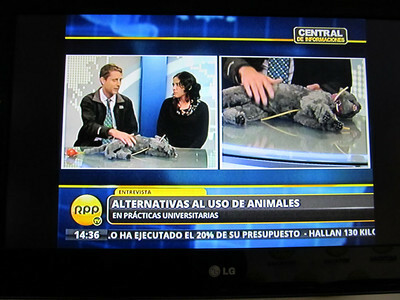 This was fairly essential, given that I couldn't speak Spanish and most of them couldn't speak English. 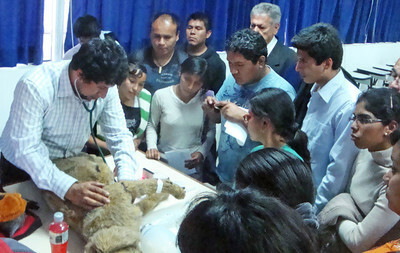 Here Dr. Alberto Delgado, who teaches as the Universidad Ricardo Palma veterinary school in Lima, using the Critical Care Jerry mannequin from Rescue Critters and other alternatives, demonstrates the use of Jerry. This mannequin produces normal and a range of pathological heart and breath sounds, and does several other things. Here a student practices endotracheal intubation with Jerry. The tube must be correctly positioned in the airway to allow connection to an anaesthetic gas machine. These students are exploring a human surgical mannequin from Limbs and Things. The simulated subcutaneous tissue above the artery is disgustingly fatty, and gloves are strongly advisable, just as in real life! 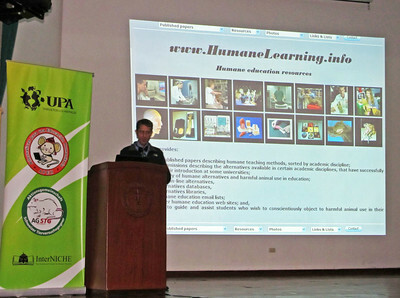 The next day it was off to the Universidad Peruana Cayetano Heredia vet school in Lima, for a presentation to about 40 interested students and faculty, followed by this meeting with the faculty. Most were supportive of the idea of humane alternatives, other than the physiology academic at the left (just like when I was a student! 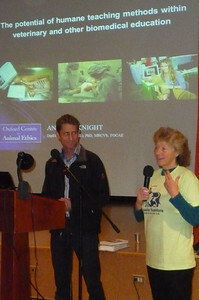 ), who strongly believed in having her students perform invasive animal experiments. By the end though, eyes had been opened and bridges formed, and she assured me she allowed alternatives for students who requested them. Next it was off to this major radio/TV station for what I'd been told would be a radio station. At the last minute though, it turned into a TV interview! Milagros had known all along, but neglected to tell the rest of us. That was fine though - I like surprises! It was just lucky we'd brought our 'Fluffy' cat mannequin from Rescue Critters. 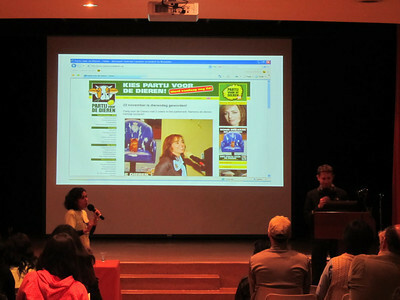 Teresa did a fabulous job translating again. We both had to be fast and short, given that it was for TV. This required focus - not easy given that the cameraman was silently struggling not to burst out laughing the whole time - I presume at Fluffy, but we never found out. It was extremely distracting though. It's amazing what you can ignore when you have to. The clips can be watched here, here and here. 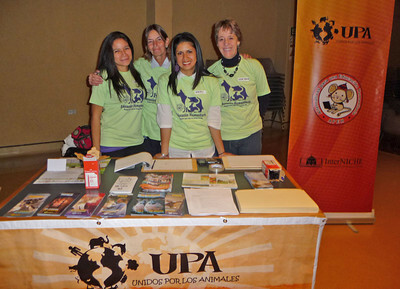 The next evening UPA organised their Conference for Animal Protectionists. 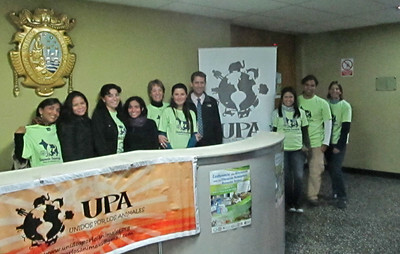 UPA Director Corrine opened proceedings with a short presentation about UPA. 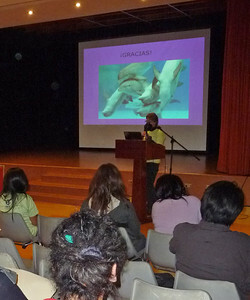 She is obsessed with dolphins, and predictably managed to include them in her presentation. As did Teresa! 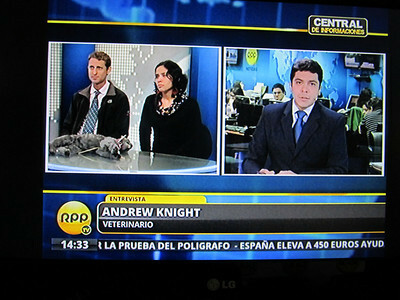 Here I'm speaking about Animals Count, our British political party for people and animals. 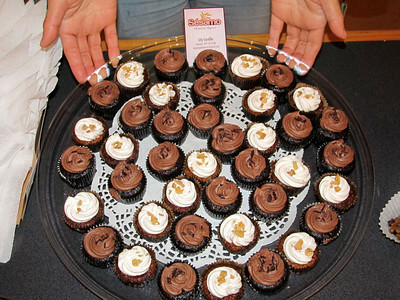 Quite possible the gourmet vegan food was the reason they all stayed so late! 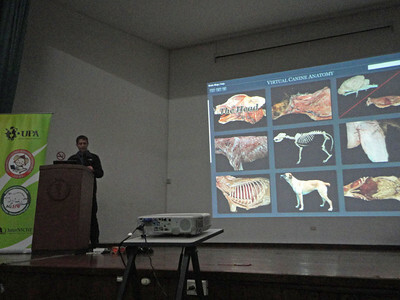 The next day we met the Faculty at the Universidad Nacional Mayor de San Marcos vet school in Lima, and provided another presentation. That evening was the start of the main Humane Education & Animal Welfare Conference held at the vet school, organised by all of these wonderful people and more. Extremely importantly, the conference was sponsored by Nescafe, and this wonderful Nescafe girl provided free coffee throughout! 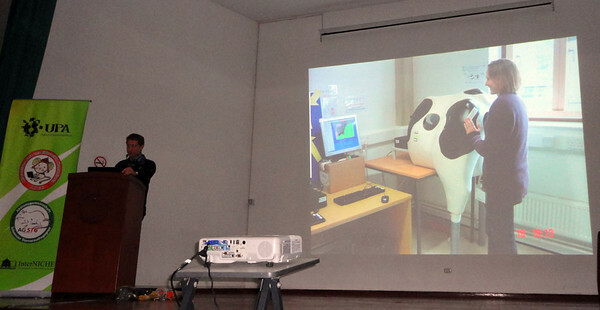 I gave five one hour presentations over three days. 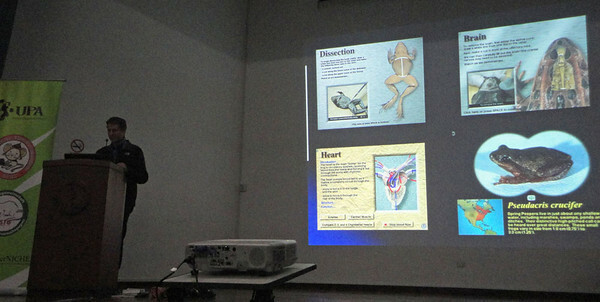 Computer simulations of dissections often offer additional educational features not offered by traditional dissections. They may be made freely available via the internet, allowing students to revise and use them at time that suit them, or from home, etc. 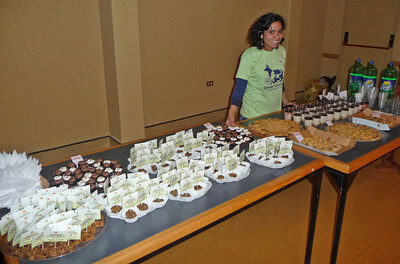 This example was created by Colorado State University veterinary school. 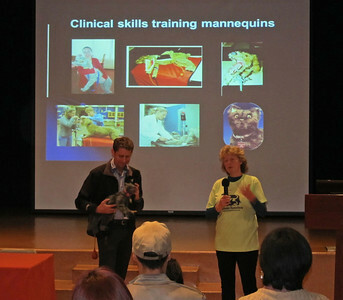 Mannequins can be used instead of live animals to teach clinical skills such as CPR. Here University of Queensland veterinary student Dr Bryony Dixon practices on a Jerry mannequin. In 2011 she became one of the first UQ students to graduate without participating in harmful animal use. 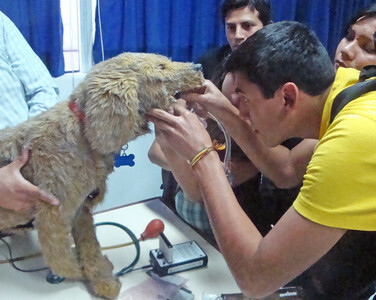 However, the more sophisticated mannequins can be costly, so at the Universidad Ricardo Palma vet school the students make their own! 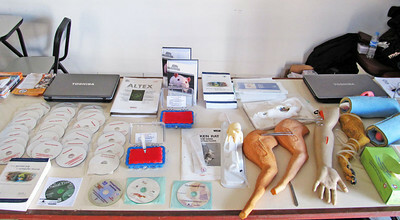 These canine legs are used for venipuncture (blood draw) training. Here Dr Dixon uses a a haptic bovine rectal palpation simulator (for learning pregnancy diagnosis) at the Royal Veterinary College near London. Haptic simulators apply forces to students' fingertips that are anatomically appropriate depending on their position inside the simulation. 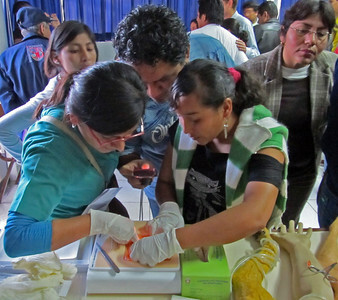 Plastination is one of several methods that can be used to permanently preserve cadavers and organs, eliminating the need to source new animals each year. 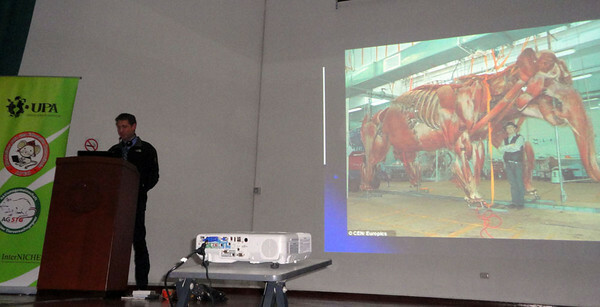 Very large animals can be successfully plastinated.